One of the coolest ways to get acquainted with the snazzy new features in Windows 10 is to dive right into the new Windows 10 keyboard shortcuts. 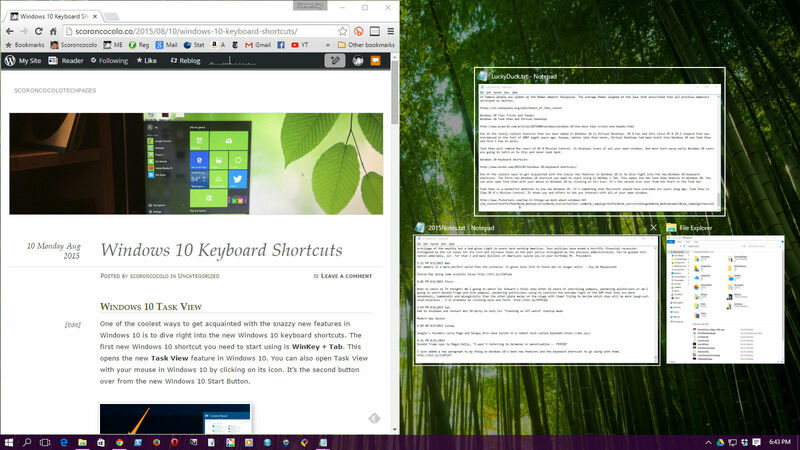 The first new Windows 10 shortcut you need to start using is WinKey + Tab. This opens the new Task View feature in Windows 10. You can also open Task View with your mouse in Windows 10 by clicking on its icon. It’s the second button over from the new Windows 10 Start Button. 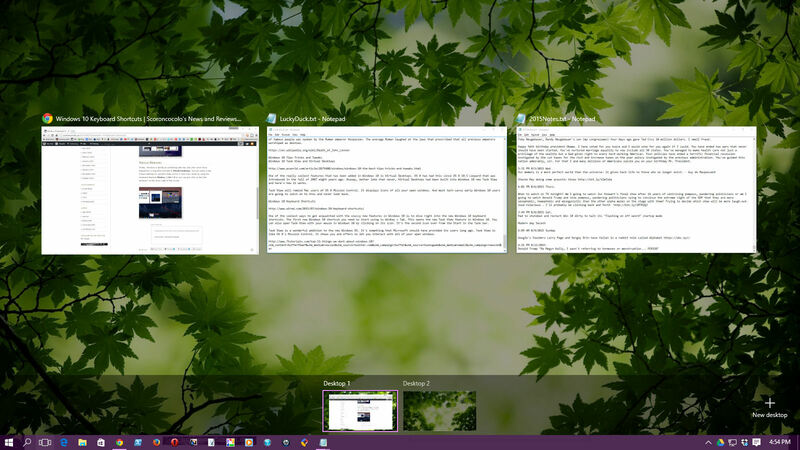 Task View is a wonderful addition to the new Windows 10 OS. It’s something that Microsoft should have provided its users long ago. Task View is very similar to OS X’s Mission Control which Mac users have had since 2003. It shows you and offers to let you interact with all of your open windows. Here’s what it looks like. Finally, Windows is giving us something else Mac and Linux users have enjoyed for a long time and that is Virtual Desktops. You can make a new Virtual Desktop for yourself whether you’re in Task View mode or not by using the keyboard shortcut WinKey + Ctrl + D or if you are in Task View mode you can just click on the New desktop X at the lower right of the screen. 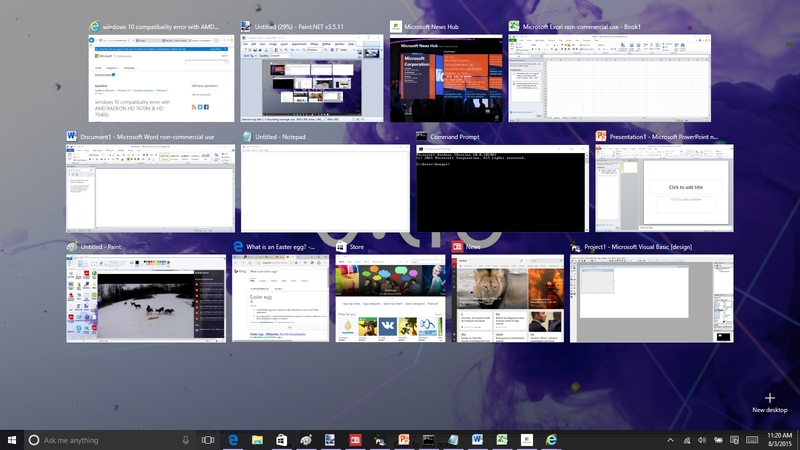 You can create as many Virtual Desktops (some call them work spaces) as you like. You can see an icon of them in the horizontal bar beneath all your open windows while you’re in Task View mode. You can click on an icon to move to that Desktop. Or, whether you are in Task View mode or not you can move between Desktops with the keyboard shortcut WinKey + Ctrl + ArrowKey left or right. Another feature in Windows 10 that people are talking about is Snap Assist that lets you quickly snap two windows together full screen so that you can compare them and interact between them. Of course this is not something that is altogether new. Both Windows 7 and Windows 8 had something similar to Snap Assist. But in those older OS’s you could snap a window to the left or right of your screen but you would have to manually go hunting for a partner window to fill the other side of the screen. 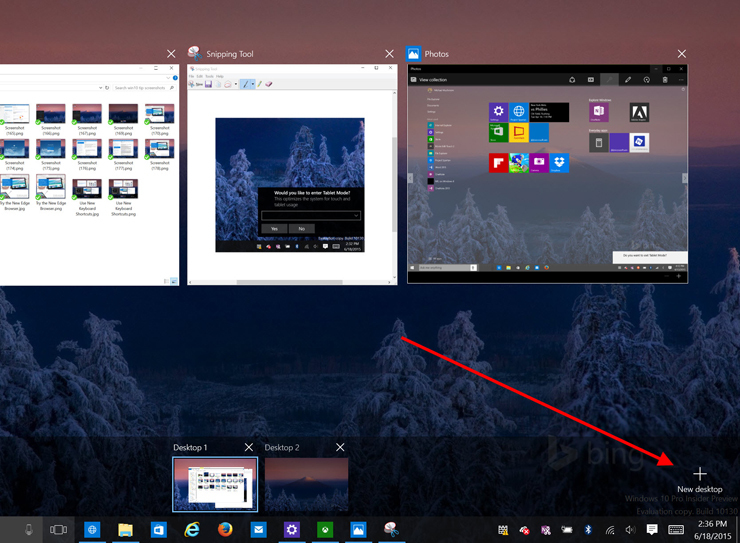 In Windows 10, if you snap a window to the left or right side of your screen, Windows will display all of your open (active) applications (windows) in Task View mode so you can click on one to choose it to be the second half of the screen. In Windows 10 there are two ways to navigate into Snap Assist mode. You can grab a window by its title bar and drag it to the left or right so far that it half-screens itself or you can use the keyboard shortcut WinKey + Arrow left or right. Either way the window will be full-sized on half the screen and all other open windows will be offered as candidates to partner on its other side.